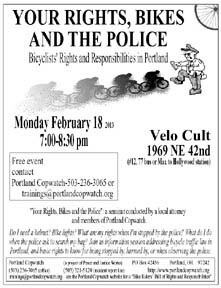 Cyclists of any stripe are invited to attend "Your Rights, Bikes and the Police," a seminar conducted by a local attorney and members of Portland Copwatch, on Monday, February 18 at 7 PM at Velo Cult, 1969 NE 42nd (#12 or 77 bus, or Max to Hollywood station). Do you have to carry ID when you ride? What kind of lights and reflectors are required by law? What do you say when an officer asks to search you? If you've ever wondered, come to this seminar and get answers to these and many other questions! This is a free event. You can get more information or register by calling 503-236-3065 or emailing trainings@portlandcopwatch.org. See the Portland Copwatch website for a "Bike Riders' Bill of Rights and Responsibilities."